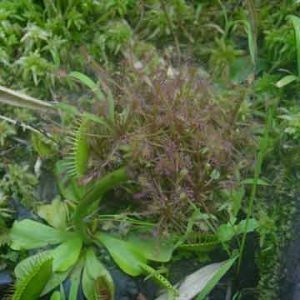 Sundews are in the genus Drosera. There are several species, here are a few of the more popular ones. Sundews have small hairs or tentacles with glands on the ends. The glands exude attractive nectar, adhesive compounds, and digestive enzymes. When an insect lands on the plant it sticks to the glands and nearby tentacles bend toward the insect, further trapping it. The prey is slowly digested. There are more than 180 species of Drocera and they grow on every continent except antartica.